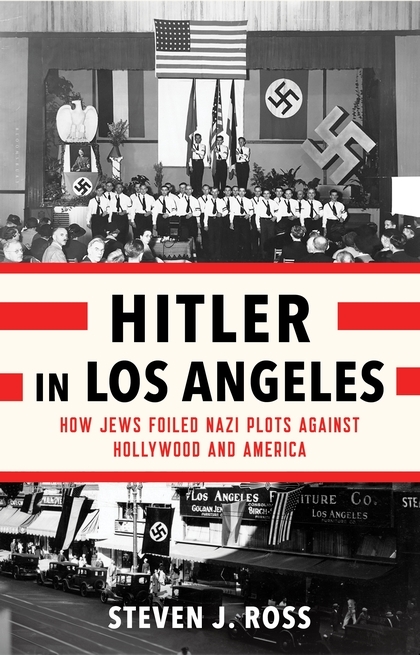 Veteran journalist and author Joseph C. Goulden reviewed Steven J. Ross' Hitler in Los Angeles: How Jews Foiled Nazi Plots Against Hollywood and America for the Washington Times. As Adolph Hitler tried to spread his Nazi tentacles beyond Germany in the 1930s, he benefited from a so-called “fifth column” of ideological supporters in several nations, notably France. But many of his henchmen — formal or free-lance — also had their eyes on the movie capital of the world: Hollywood. An estimated 150 million persons worldwide saw at least one movie weekly, most of them produced by Hollywood studies with Jewish owners. So Germany launched a two-pronged attack on the industry. The first goal was to prevent the studios from producing films attacking Hitler or his government, a chore eagerly pursued by Georg Gyssling, the German consul in Los Angeles. The second target was the movie mogul themselves, and the major stars of their films, who were targeted for assassination by ad hoc bands of Nazi sympathizers. One plot discussed was to have machine-gun squads drive through the Jewish neighborhood of Boyle Heights, murdering anyone in sight.